Where are the Curvy Girl Trendsetters? I came across a picture of a dress by Alexander McQueen and immediately recognized it as the Lola Colorblock Swoop Dress by Monif C. First off, I am not attacking Monif C. I have no proof that her dress is a knock off, I just found the similarity between her dress and this one uncanny. This actually made me wonder if it's true that the plus fashion world has no innovators....only trend followers. I've heard it time and time again that plus size women wait to see what straight size women are wearing and then follow the trends they wear instead of creating their own looks. It seems the plus fashion world follows a trend even if it's 1-2 years after it has graced the straight sized runway. Kind of like ....discount stores that rip the runway a couple of seasons after the major designers create the trends. Do we ever want to be the first with a look? What if a plus size designer created a line that even the straight sized women wanted? Something that no one else had yet....would we support that? I have a friend who is a plus size designer who was told by a mainstream designer that she "shouldn’t worry her pretty little head about being creative because her consumer only wants only what has already been done". Is that true? Do we need or want the straight sized industry to determine our trends as well? Wouldn't a plus size designer know what cuts work best for curvy bodies even if they weren't "what everyone else was already wearing?" What does the curvy "fashionista" really want? 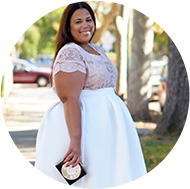 Do you want plus size designers to make straight size fashion in plus size or do you want them to create their own looks from their creativity with the chance that a piece or look may not be in mainstream fashion? I have heard answers from both sides. I would love your feedback. You know what? I am on the fence with this one. I find that when we see something we want, naturally, it is not in our size, nor is it cut to work with our curves. So when a plus designer interprets it for our curves, I am in love! On the other hand, I do want that fierce piece that no one else has dared to venture out and make, innovative and creative to my hips, thighs, arms, and bust, all while appealling to our fashion addiction. Mainstream designers have been doing this to each other for a while, and I do not see it being too bad, I just would hope for the look "with a twist" you know??? I agree with Marie, it's natural to want what you can't have but it would be nice to see it reversed. I wonder if designers made more couture pieces for plus size women, if we would see more innovation? I am always looking for unique pieces. I have my clothing staples, but I want the great investment pieces. I would absolutely buy them if they were well made and flattering. I do wish that a great plus size designer on the McQueen and Galliano level would come along. I've thought many times about taking a McQueen style to a tailor and having it made in my size. I guess this isn't any different. i'm not really interested in "on trend" or "setting trends" -- it's the niche choices that slim women have that i really envy, the repro vintage a la trashy diva or steampunk, who do their own distinct and lovely thing, but not in my size. Thanks ladies Im loving all the great honest comments. Keep them coming! I have to agree with MarieDenee. I want both. I should be able to have the best of both worlds. Our smaller counterparts have it that way, so why shouldn't we be able to also. @Laura I am completely aware of how clothes are manufactured thats why I do support the very few plus size designers that actually make there clothes on U.S. soil if thier pieces match my aesthetic. I also support small designers from etsy who I know manufacture here also. I wont support anything that I do not like or lacks quality. My closet is proof of this. But to say that I cant support a Walmart, Target, Banana Republic at this time is crazy but I will literally have to walk around naked b/c at this time not enough people manufacture their own clothes and even fewer do it in plus. As for the Norma Kamali dress at Walmart I do understand that the convertable dress has been done many times by many designers. But Norma Kamali is a designer trying to put a different twist on the same sillouette that have done for decades now, so its not quite the same as Walmart ripping the dress b/c there is a actual designer other than Walmart's team behind the dress...that is obvious from just the general quality of the dress. So Im afraid I can actually have it both ways its limited as of now b/c of slim amount of choices. I'm not fashion savvy enough to really care about keeping up with the latest trends for straight sized women or plus sized ladies. What I usually look for from plus-sized designers are clothing items I won't see on most of the women I encounter on a daily basis. Meaning, I want something original...made just for someone my size/plus. Not the same clothing my size 6 coworkers are wearing, just in a plus size. It always aggravates me to pick up a really nice outfit in the "Women's" section of a department store (onsite or online) and then go to work or to an event and see some skinny person wearing the same exact outfit. I'm not confident enough to want to stand side by side with a size 6 wearing the same outfit, kwim?